The Mt. 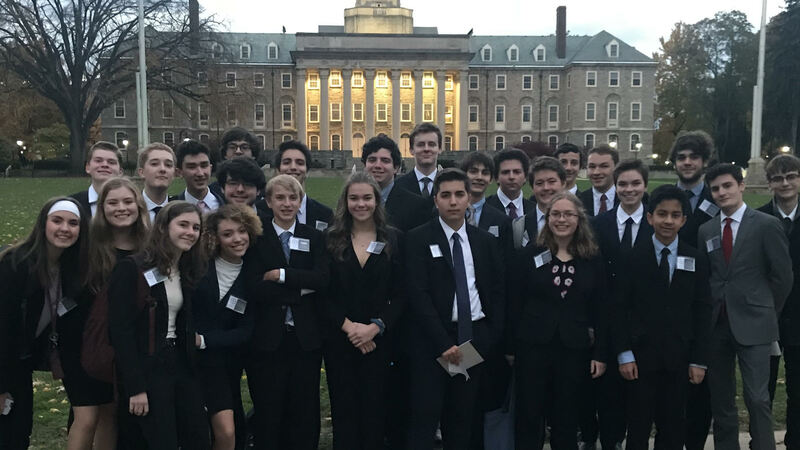 Lebanon High School Model UN team had great success at the Penn State Model UN tournament on November 2-4. Twelve students won individual honors in the eleven committees in which they competed. Overall, the team won the "Outstanding Delegation" award. Model United Nations is a simulation of the UN General Assembly and other multilateral bodies. In Model UN, students step into the shoes of ambassadors from UN member states to debate current issues on the organization's agenda. While playing their roles as ambassadors, student "delegates" make speeches, prepare draft resolutions, negotiate with allies and adversaries, resolve conflicts, and navigate the Model UN conference rules of procedure - all in the interest of mobilizing international cooperation to resolve problems that affect countries all over the world. From public speaking to critical thinking and in-depth research, student delegates draw a wealth of knowledge from the Model UN experience.